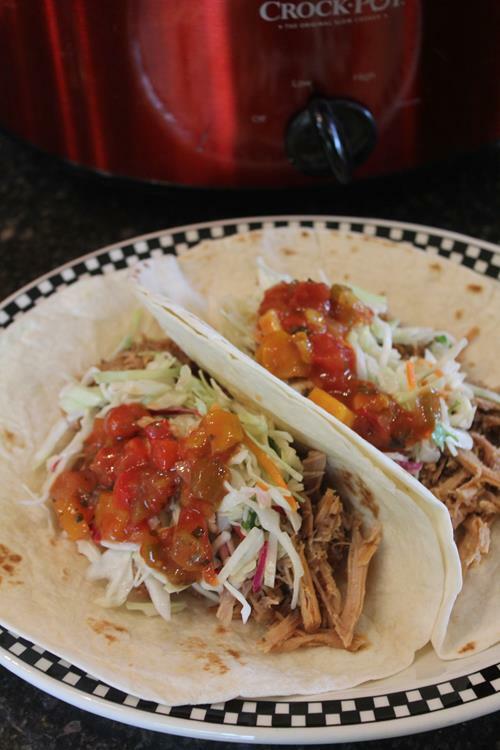 This Two Ingredient Slow Cooked Mexican Pork is easy to make and can be used in so many ways! 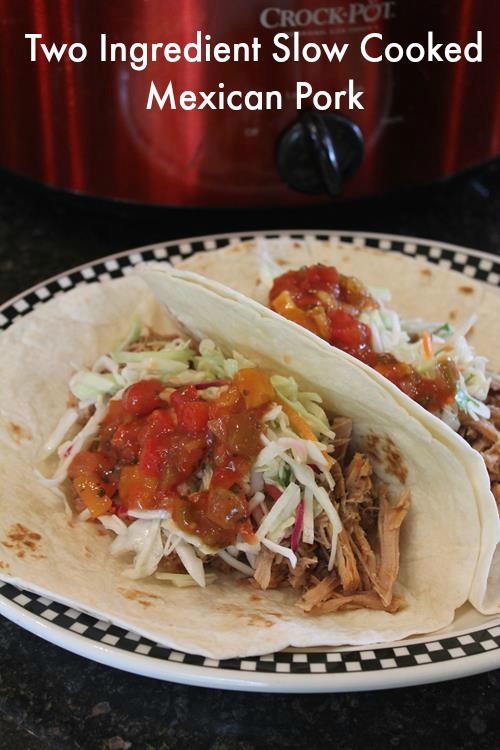 Easy slow cooked meals are one of my favorite type of meals to make. When they only contain a couple of ingredients like today’s recipe, they are even better. I can’t really take the credit for today’s recipe. A friend brought this to a church dinner recently and it was so good I knew it was going to become a favorite at our house. When my friend made this she served it as shredded meat on hamburger buns. I served it as pork tacos. You could also easily use this for nachos or burritos. It is one of those shredded meat recipes that can be used in so many ways. Which makes the recipe even better. This recipe calls for two ingredients. That is it. Pork and salsa. Now I have done meat and salsa in my slow cooker before. I have even posted recipes for it, but what makes this recipe different is the salsa that you use. 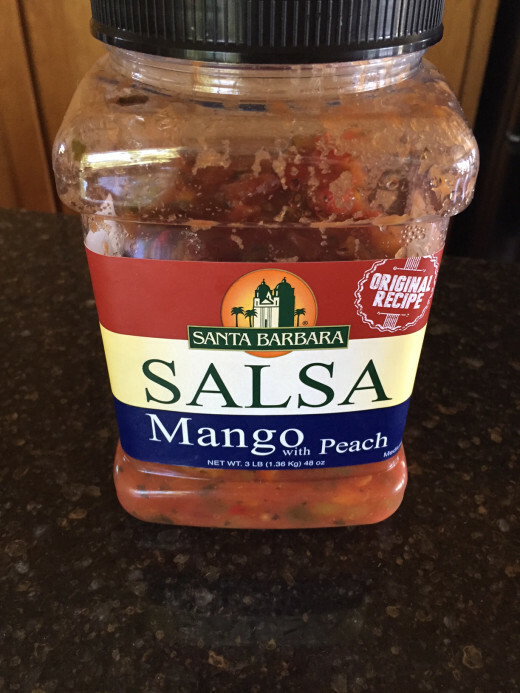 Mango Peach fresh salsa. It makes all the different in this shredded Mexican type meat. This is the kind from Costco, but I know other stores sell a similar salsa. The flavors of the mango and peach in the salsa pairs so well with pork. The fact that is is fresh salsa also helps make it more flavorful and fresh. It is so good. I had no idea that a fresh salsa in a slow cooked recipe would make such a different with the end result, but this does. 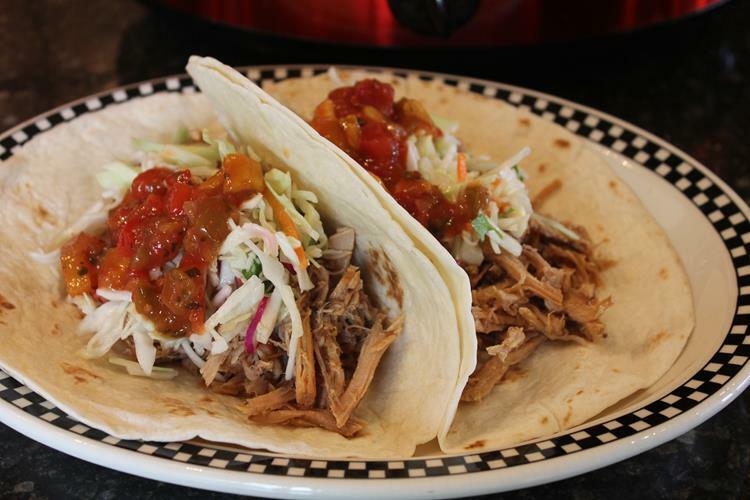 I served this as pork tacos with the Mexican cole slaw I used my Pulled Pork with Mexican Cole Slaw recipe. This recipe today is actually a similar idea, but easier to make since it only contains two ingredients. You don’t have to serve it with cole slaw. You could also serve it with beans, cheese, and extra salsa. I think it would also be good on taco salad. I think I will try that next time I make it. However you serve it, I think you will enjoy it. 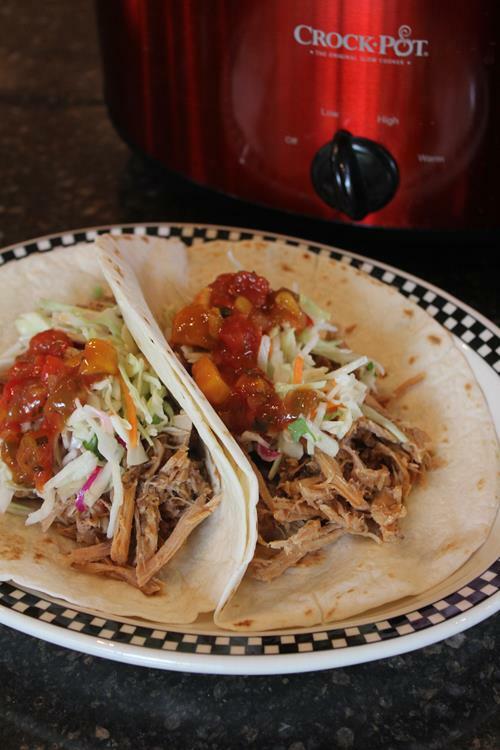 Place roast in slow cooker and cover with mango peach salsa. Shred meat. Add some of the liquid from the crock and some extra fresh salsa to the meat if desired. Serve on tortillas as taco, on hamburger buns as sandwiches, or on taco salad, burritos, etc.